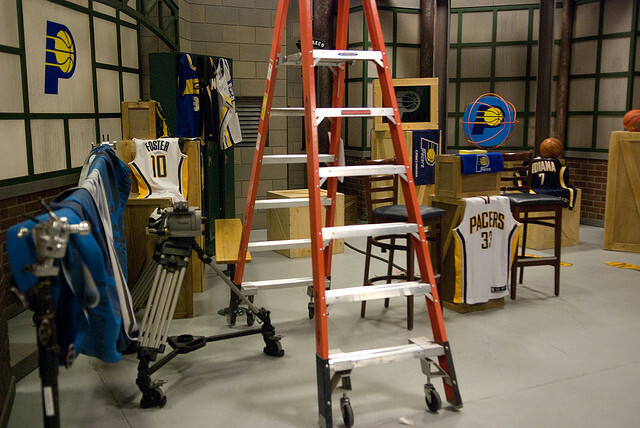 In Game 5 against the Atlanta Hawks on April 28, things got very ugly for the Indiana Pacers on their home court. The Pacers were mercilessly booed by the home crowd as they went down 3-2 with the first-round playoff series headed back to Atlanta. Aside from the humiliation of their giant collapse, the Pacers are playing to save the team in the coming days. Coach Frank Vogel and Lance Stephenson are among the key Pacer parts that could disappear should Indiana exit early from the 2014 NBA Playoffs. Win or go home, indeed. During Game 5 of the Easter Conference quarterfinals between the Pacers and Hawks, several curious moments stand out. In the Pacers’ building, Mike Scott and Shelvin Mack — not exactly a Who’s Who of the 2014 NBA — led a thrashing of Indiana while star Paul George was heckled by Bankers Life Fieldhouse fans. Both events were unthinkable just a few months ago, but the Pacers’ inability to respond to the Hawks’ advances has put them in a tough position. The No. 1 seed in the Eastern Conference, once considered a strong championship contender, is about to lose to a team with a losing record that barely got the eighth seed. Charles Barkley, Kenny Smith, and the rest of the TNT NBA team weighed in on the Pacers’ epic collapse. Before Barkley predicted the Pacers would be broken up if they are eliminated by Atlanta, Smith noted how many problems Indiana Coach Frank Vogel faced. For one, starting center Roy Hibbert appears incapable of playing (0 points, 0 rebounds in Game 5.) For another, the big-man strategy was being obliterated by Atlanta’s three-point shooting. Indiana’s effort on the glass and at the defensive end has been subpar throughout most of the Atlanta series, but it reached a nadir in Game 5. The Hawks dropped 15 three-pointers on the once-vaunted Pacers defense. During a stretch of the third-quarter, Indiana trailed by 30 points at home. Should the Pacers fall to the Hawks, or even in the second round of the NBA Playoffs, Charles Barkley said he’s “100 percent” sure the team will be broken up, whether it involves the coaching staff or the players. Both Lance Stephenson and Evan Turner are free agents after the season ends, which means the Pacers already have one key part that will go missing. While there is no direct reference to the coach, the strategy comes from the bench and the personnel changes, or lack thereof. David West was more precise in his appraisal of Frank Vogel’s approach. Vogel had the team mojo working for the first several months of the 2013-2014 season. Indiana was unstoppable and looked like the prohibitive favorite out of the Eastern Conference. Team chemistry may have been upset when Evan Turner joined the squad and Danny Granger departed at the trade deadline, but the Pacers still looked ready to roll deep in the playoffs. At this point, Vogel can’t reach Roy Hibbert, refuses to adjust to offensive onslaughts by the opposition, and is being questioned by his players in the press. Larry Bird has some serious decisions to make, but Barkley appears to be correct that this same squad and coaching staff won’t get another run at it next season.